The Denver Broncos season came to a startling halt earlier this month at the hands of the Indianapolis Colts. Despite the agonizing defeat several players had very successful seasons. The Broncos had a franchise-record 11 players reach the Pro Bowl this year and eight will suit up Sunday at 6 p.m. Whether they reached the Pro Bowl by reputation or their play is up for debate. However, due to the revised drafting of teams the players will be spread out on opposing rosters. “Team Irving” will have six Broncos while “Team Carter” will play two. Three Broncos declined to participate due to injury or their impending free agency. The three rookie Pro-Bowlers will have a lot to prove, but may be the most deserving of the recognition. Chris Harris Jr., C.J. Anderson and Emmanuel Sanders are all on “Team Irving” and will be playing in their first Pro Bowl. All three players undoubtedly earned their trips to Glendale, Arizona. Sanders and Anderson were placed in the Pro Bowl after Julio Jones and Le’Veon Bell declined to participate. Sanders had a record year in almost every way possible. His Pro Football Focus 15.6 overall grade highlights the season he had. He nearly doubled his previous receiving yards record with 1,404 yards, 101 receptions and nine touchdowns. 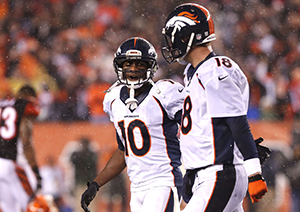 Sanders will likely be lined up against his teammate, Aqib Talib several times. He has also seen two of the three remaining cornerbacks he will face earlier in the season. Patrick Peterson and Antonio Cromartie of the Arizona Cardinals will be on the field for “Team Carter”. Sanders was adamant this year that apart from a Super Bowl victory, his goal was to reach the Pro Bowl and his hard work has paid off. Anderson burst onto the national scene in the second half of the year and despite his limited playing time in weeks 1-9, he showed that he can be an elite back in the NFL. His Pro Football Focus rating of 19.8 placed him in a tie for third-best in the NFL. The front of “Team Carter” will be a familiar sight for Anderson. 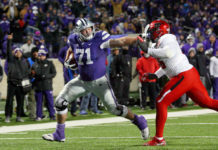 He will have to navigate through the likes of J.J. Watt, Donatri Poe, Kyle Williams, Marcell Dareus, Mario Williams, Calais Campbell on his way to the next level. The Broncos faced each of those immensely talented defensive linemen throughout the 2014 season. As a rookie to the Pro Bowl Anderson will be fired up to prove his spot on the roster. Harris Jr. is another rookie to the Pro Bowl but is no stranger to proving himself. The undrafted cornerback from the University of Kansas is certainly ready for the challenge. Coming back after a big knee injury in 2013, Harris Jr.’s season could not have been more impressive. According to Pro Football Focus, he did not allow a touchdown all season while playing in over 1,000 snaps and he only gave up 354 yards receiving in coverage. His rating of 28.4 earned him the top spot of all cornerbacks in 2014. The incredible nature of his play earned him a big contract and a spot amongst the best Sunday. He will have plenty of opportunities to display his “shutdown corner” skills as he faces Antonio Brown, A.J. Green, Jordy Nelson and the all-too familiar T.Y. Hilton. He will likely be itching to cover Hilton who was paired against Talib for most of the playoff loss. Ryan Clady, DeMarcus Ware, Von Miller, T.J. Ward and Talib will all make return trips to the Pro-Bowl. Clady and Talib will be on “Team Carter” while the rest will play for “Team Irving”. 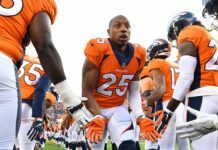 Ware, Clady and Talib seem to have made the team more by reputation than their 2014 play. Ware started out the season in promising fashion. He had eight sacks in the first eight games and only managed two the rest of the season. Opposing offenses were getting rid of the ball particularly fast down the stretch but Ware’s decline in sacks could not be understated in the second half of the season. Clady simply did not play up to his high standards. He nearly missed the entire 2013 with a Lisfranc injury and never seemed to be fully healthy throughout the 2014 season. His 41st rating among NFL tackles reflects his spotty play. His -2.8 overall rating is a drastic drop from his 2012 rating of 22.8. It remains to be seen if he can regain his form and continue on as a vital piece of the Broncos offensive line. Lastly, Talib played at a Pro-Bowl caliber at times this season but his worst moments cost the Broncos at critical times. In all but one of the team’s 2014 losses Talib had terrible performances. None were more noticeable than his performance against Hilton and the Colts. 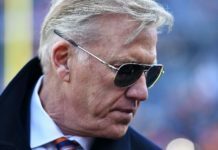 Former defensive coordinator, Jack Del Rio refused to place Harris Jr. on the dynamic wide receiver and as a result Talib was torched throughout the game. According to Pro Football Focus, he allowed 90 yards receiving and a touchdown to the Colts and five total touchdowns on the season. Sunday he will have a chance to prove his worth or be exposed after a rough year. Talib will have his hands full facing off against Sanders, Odell Beckham Jr., Randall Cobb and Golden Tate. Peyton Manning, Julius Thomas and Demaryius Thomas declined to participate. Manning, who takes the friendly game as seriously as anyone, had to pull out due to his nagging injuries. Both of the Broncos pass catchers declined to play in light of some injuries but more likely because of their free agency situations that hang in the balance. The Pro Bowl is hardly taken seriously and players clearly want the recognition for their efforts but many dislike playing in the actual event. The Broncos have a league-high number of players elected to the game. Sunday will provide the platform for all of them to validate their election to the scrimmage. It will be interesting to see who provides the best and worst performances for the orange and blue. Don’t be surprised if the newcomers make the biggest impact in Arizona.